Cameron Menzies and Deborah Cheetham chat to the Breakfast Spread about the upcoming Coming Back Out Ball on Saturday October 7. 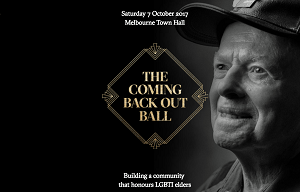 Taking place at the Melbourne Town Hall, the Coming Back Out Ball is a spectacular social event celebration Lesbian, Gay, Bisexual, Transgender and Intersex (LGBTI) Elders. Hosted by the much-loved Australian arts icon Robyn Archer, The Coming Back Out Ball will feature lendendary LGBTI performers including Carlotta, Deborah Cheetham, Toni Lalich, Gerry Connolly and Lois Weaver supported by an orchestra conducted by Kathleen McGuire. Created and produced by All The Queens Men, this night-of-nights will blend showbiz bells and whistles, community celebration, heartfelt story telling, dinner and dancing. This spectacular evening will be free for LGBTI elders 65+ to attend. Bookings essential and tickets are limited. Head to the Facebook event page here for more details. Mallard Movies hosts a FREE screening of the documentary Garage Rockin' Craze; exploring the underground garage and rock scene in Japan. Rock-A-Bye Baby returns in 2019 February 28th at the Fitzroy Town Hall with electronic pop artist Ella Thompson.